We're a little excited today - it is the eve of an exciting event. Peekaboo Magazine are spreading their wings and growing from one magazine to three, and their new publications launch tomorrow! 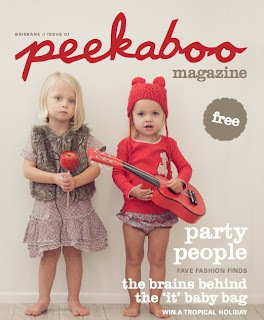 If you haven't seen it before Peekaboo is Australia's FREE boutique family lifestyle magazine full of beautiful and inspiring things for you and your munchkins. It is printed quarterly with three versions; Brisbane, Sydney and now Melbourne - which means localised stories. We are thrilled that our Sunday Woodend market is going to be one of the first places you can get your hands on this gorgeous mag. Yet another reason to come along and join in our 1st birthday fun!